I'm running the wheels off of my little Fiat. So far this week, I've been to Allentown PA, Cape May, Philly, Sea Bright NJ, and Chester County - all before or after work. This is a long story without photos, so be prepared . . .
First, I left the house at 5:15 AM and sped up the northeast extension of the PA Turnpike to a quarry near Allentown to see that damned Barnacle Goose. I arrived before dawn to find the entire quarry hidden by fog and locked away behind chain link fence on private property. I drove up and down Rt 326 with the daily commuters and heavy construction trucks looking for a way in to the quarry. I finally saw a little opening in the fence along the road, so I parked the car at the quarry entrance just before the "Private Property" and "No Trespassing" signs and walked up the road along the shoulder. The walk was scary enough but nothing compared to what I found at the fence opening. The fence was literally at the ledge of the quarry. The other side of the opening was about 100 feet above the water on a sheer vertical cliff. I hate heights. I mean it, I almost fainted. Ask Connie about our hot air balloon experience sometime. So there I was - gripping the chain link fence for 20 minutes waiting for the fog to part so that I could see the geese below. Four geese appeared out of the mist, then another 10, then about 100 Snow Geese took flight, then nothing. Finally, more geese starting gliding into view and viola - there was a smaller, blacker goose with a bigger white patch on the head - the Barnacle Goose! Let me get the hell out of here. . . I quickly regrouped at the car and went speeding back down the Turnpike, over the bridge, down Rt 55 and into Jake's Landing Road where another birder had reported 3 sparrows the day before - Seaside, Saltmarsh, and Nelson's - all of which I need for the list. I love Jake's Landing. It was so soothing after my harrowing experience at the quarry. Nothing to fear here. The marsh was flooded due to last week's storm which was probably good for me since the birds were pushed up to the parking lot. I had all 3 species within 15 minutes. No good photos however. Off to my next stop - Tuckahoe WMA for Golden Eagle and Eurasian Wigeon. This proved to be frustrating since I have never been there before. The map on GPS makes it look like a road runs through the area but it doesn't. The road is blocked at both ends but only after you have to drive down dirt roads strewn with pot holes. Remember, I'm in a Fiat here bumping along. My first attempt was a total bust - no ducks, no hawks, no eagles, no nothing except a lonely swan. So I went bumping along to the other entrance. This time, I walked out on the "road" and the eagle flew right past me! One down, one to go. After a lot of scanning around the impoundment, I managed to find the Eurasian Wigeon. Let me get the hell out of here . . .
Next stop, Salem county to search for Yellow-headed Blackbirds and Ring-necked Pheasants. Busted on both so back to the office in Philly for some real work. Sigh. On Tuesday, I made up for lost time at work. No birding at all due to really bad weather. On Wed, Patty arranged for us see a LeConte's sparrow in Chester County. This is a rare bird that has been there since December, but has not been reported on the Internet due to being on private property. The park ranger agreed to meet us after work and take us onto the property which was really nice. Unfortunately, we only saw a brief glimpse of a bird that was probably the LeConte's. Sigh. I don't think we can count it. We will have to go back another day and hope to see it. On Wed, I found myself leaving the house at 5:30 again in order to be in Sea Bright NJ (think Hurricane Sandy territory) by 7 AM in hopes of seeing the Western Grebe that was reported over the weekend. As you can guess by now - I drove up and down Ocean Ave for an hour looking of that bird without success. There is a high sea wall between the road and the ocean which made it difficult to scout for the bird. Plus it was really cold and windy. Ugh. I do not have any photos from running around this week, so here are a few from Sunday. 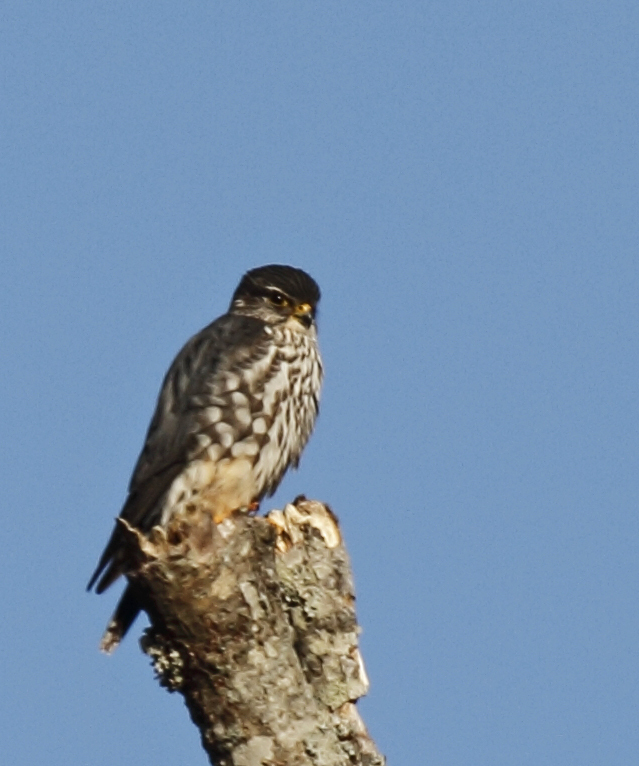 First is a Merlin trying to blend into the tree snag. 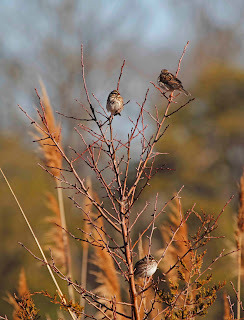 Next photo is a bunch of Savannah Sparrows hanging out. I hope to have more successful news and photos next. As usual, I'm exhausted just reading your post! Amy wants to know how much longer you will be doing this particular "hunt".